Introducing the world's most advanced marine stereo for its size, the compact MS-RA205 with FUSION-Link™ NMEA 2000 connectivity. This fully featured marine stereo delivers powerful, clear and dynamic sound, all encased in a chassis which measures a mere 93mm - 3-5/8” in depth. Powered by an advanced ARM-9 Processor, the MS-RA205 offers quick and intuitive audio control. FUSION’s iPod/iPhone interface allows smart navigation of the iPod menu structure and offers selection of songs by artist, song, playlist, album, genre or composer. Apple iOS and Android/Windows MTP Media Playback - Connect your supported Apple, Android or Windows device via USB to your MS-RA205 for intuitive and quick access to your entire music library for unbeatable music playback while at sea. Download the latest FUSION software HERE to access this functionality, and find the MTP device compatibility list HERE. A FUSION UNI-Dock™ (sold separately) can be installed for water resistant protection of your device whilst charging and playing music. 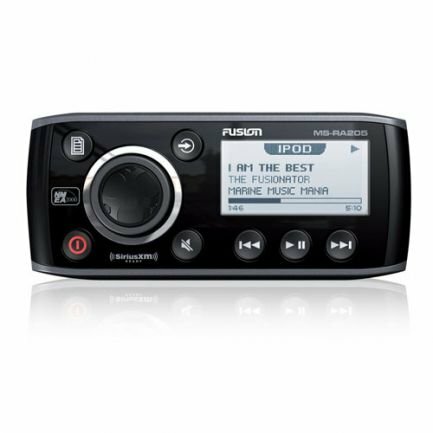 Bluetooth Audio Streaming - Add the MS-BT200 or MS-BT100 to your FUSION 205 Series marine entertainment system to enjoy your favorite audio tracks within range, around your vessel. 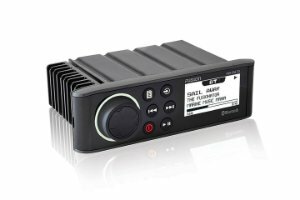 The external MS-BT200 Bluetooth module provides Bluetooth audio streaming capability from a compatible device directly to your FUSION marine stereo. The MS-BT200 is connected to the Satellite Radio (SiriusXM) connector of your stereo. 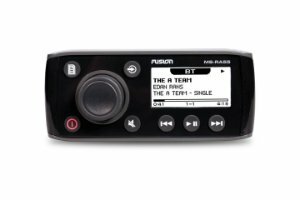 The MS-BT200 supports control (Play/Pause/Next/Back) of the media device from the FUSION Stereo. Note: The MS-BT200 cannot be operated simultaneously with a Satellite Radio (SiriusXM) receiver. 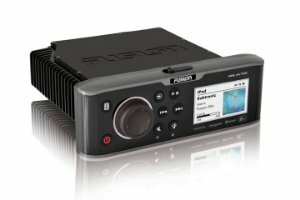 For installations where the Satellite Radio (SiriusXM) connector is not available the FUSION MS-BT100 audio only Bluetooth module is recommended. Song information such as song title, artist name and duration are displayed, depending on the capability of your phone and music application. The MS-BT200 does NOT provide phone call control. Hands free operation of the phone is not supported from the FUSION stereo. 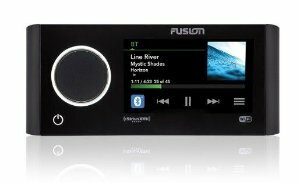 DAB+ ready - Connect the optional FUSION DAB+ module to experience high quality digital radio and an expanding assortment of stations. (Only accessible where DAB is supported). Multi-zone™ Technology: Two independent audio zones are available, each with localized menu controls. Each zone can be named for added convenience (e.g. Zone 1 can be named “Helm”). For localised zone control, install up to two FUSION NRX wired remote controls. In instances when a FUSION NRX wired remote control is installed onto a NMEA 2000 network the remote can be configured to display user selectable data from other NMEA 2000 products connected to the same network*** (e.g. Depth or Speed over water) Note: A FUSION NRX wired remote control is the only wired remote control solution for this product, the MS-WR600C or MS-WR600G is only compatible with the MS-RA200.